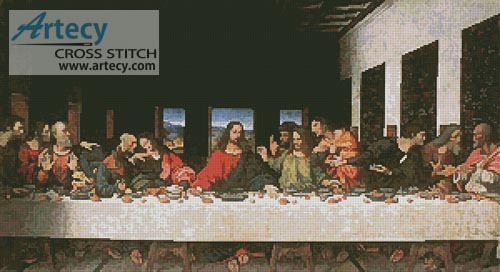 Reviews: Last Supper Counted Cross Stitch Pattern to print online. A friend of mine started her first cross stitch and it was of the Last Supper. She was having difficulty with it so I said I would be happy to finish it for her. BUT the pattern she had was terrible!! So I purchased this pattern to use and she loved it. Much more detail than the one she had. She was making it for a gift for a relative. It did turn out lovely. 10 panels but went pretty quickly. I must compliment Artecy on their high quality patterns especially for reproductions of artwork with extreme detail. I love all that I have done & look forward to doing many more. This is my "to go" place for great patterns.